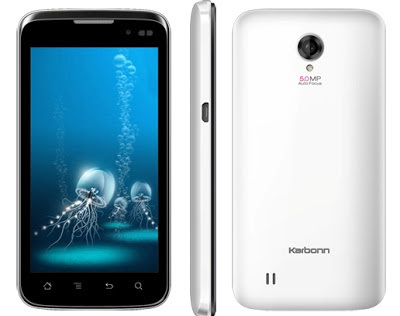 A brilliant Smartphone Karbonn A9 Plus has been launched by leading mobile phone company Karbonn. Karbonn A9 Plus sports a 4.0 inch IPS capacitive touch screen which ensures excellent graphics rendering and wide viewing angles. It runs on Android 4.0 Ice Cream Sandwich powered by 1.2 GHz Dual Core Processor of 512MB RAM. It has a 5.0 MP camera at the back for shutterbugs and 1.3MP camera at the front for video calling. It has 4 GB of inbuilt storage that is expandable up to 32GB via micro SD card. It supports Wi-Fi and 3G connectivity and is powered by 1420mah Battery. The Karbonn A9 Plus Dual SIM Android mobile phone that has already made a huge fan following. A9 Plus has Android 4.0 Ice Cream Sandwich operating system. It has large 4.0 inch display that displays everything clearly. For pictures and video viewing it has wide-angle viewing option. This phone is powered with 1.2GHz ultra fast processor that makes your operations faster. Capture your memories through the high definition 5MP camera with LED flash. It has Auto Focus and Face Detection features. Enjoy video calling at a better quality as this phone has 1.3MP front camera. Karbonn mobile price list shows that the brand is taking care of aristocrats as well as middle class people. Access Wi-Fi hotspots to access internet through the Wi-Fi feature that gives you maximum signal strength. This phone is enabled with GPS navigation that helps you to locate the nearest restaurants, ATMs, theatres, outlets and more. You can store more data as the expandable memory of this phone ranges up to 32GB. Be in touch with your social network friends through applications like Facebook and Twitter. Enjoy playing the most entertaining game Angry Birds that can be downloaded from Google Play. It comes along with one year warranty. Capture all your precious moments that you would like to cherish with the HD 5 MP Auto focus with LED Flash Camera and get brighter and clearer pictures. There is a secondary 1.3 MP front camera that you can use for video calling and stay connected with friends and loved ones always in a better way. You can use Google talk or Skype for video calling. It has a powerful 1420 mAh battery that has a stand by time of 200 hours, Talk time of 4 hours. So enjoy talking to people and stay connected always. Karbonn A9 Plus price is approximately 7,990/- INR and is available in all the major cities of the country and can be ordered online too. The price is keeps on changing so it is recommended to check and compare it on different website to get the best value for your money. It is really affordable phone in the range of well-designed android mobile phone incorporating such awesome features. Author Bio: Taranga Sharma is a well known author and has written more updates or information on karbonn mobiles and blackberry mobiles as well as other latest, upcoming and most popular mobiles.